How is this website structured? How can I access the Toolbox content? How are the measures presented? Is the toolbox available in other languages than English? How can I contribute to the RESTRAIL Toolbox? The content is grouped into sections and articles. Sections correspond to families of measures, and articles to specific measures. 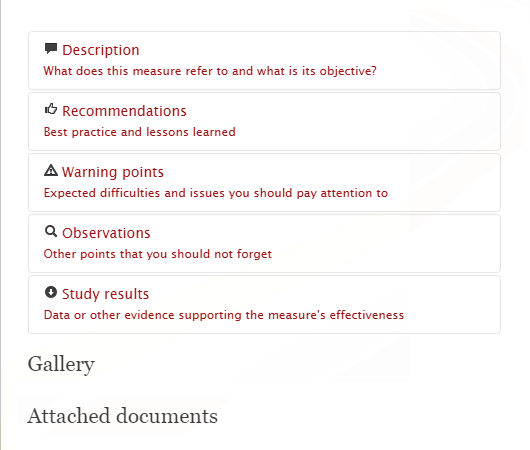 You can access the entire list of measures from the horizontal menu. Both sections and articles are indexed on several keywords which can be added or eliminated from the roll-down list. They act as search filters in the list of measures and you can use them to reduce the list according to your interests. The information available on this website can be accessed in two ways. (1) If you clearly know what you are looking for, you can browse the website from the horizontal menu or the thumbnail buttons available on the home page, by clicking on the categories in which you are interested. (2) You can also use the custom search function available in the menu. For example, if you heard about the blue light studies conducted in Japan but do not know other details about these studies, you can type ‘Japan’ or ’blue light’ in the search field and all the articles which contain these words will show up in the results. article body presenting the content in different subsections which expand or collapse when clicked (Description, Recommendations, Warning points, Observations, Study results, and Gallery with examples and/or attached documents). Note that some of these elements may be missing for particular measures. print button which generates a quick printable document of the article. The Toolbox provides an automated glossary function. Different acronyms or jargon words used throughout the text are indexed in a glossary list. This list can be accessed via the main menu. When reading an article you will notice that particular words are underlined and you will see the pop-up explanation box on mouse hover. No. However, if you cannot read English, you can use the Google Translate function available in your web browser to automatically translate the pages of this website in the language of your choice. Send us your input or feedback through the contact form or by e-mail at security uic.org.